A colwic shrine for a girl called Nyakewa killed by lightning set in the garden area behind the homestead in which she lived, with a ritual firescreen or buor constructed next to it. It consists of an mound of earth surrounded by offerings of tobacco with a sapling of the nyuot tree planted nearby, and other offerings and parts of sacrificial animals attached to a shrine-post in the centre of the mound. Nyakewa was considered to have become a colwic, a spirit taken directly by God. This specific intervention by the divine was considered so dangerous to all associated with the deceased that sacrifice was made by all relatives, and the special shrine erected. Note on print reverse ms pencil - "6 Col wic" & print front border ms ink - "NUER IV/60"
Morton, Chris. 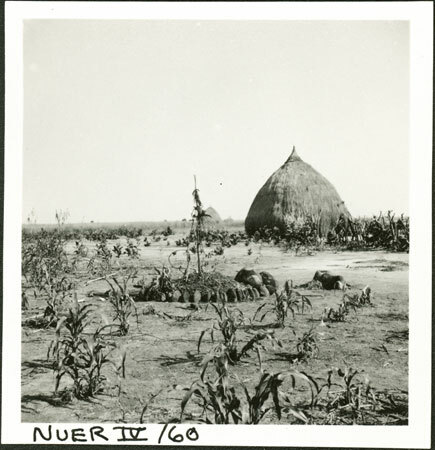 "Nuer colwic shrine" Southern Sudan Project (in development). 03 Jan. 2006. Pitt Rivers Museum. <http://southernsudan.prm.ox.ac.uk/details/1998.355.178.2/>.